Blu devices aren't having the best time lately, what with the whole privacy and alleged spyware story and their sad update track record that's left almost the entire lineup at Marshmallow. But the value for money proposition of Blu is still nice and for a non-geeky user, their devices might still carry a lot of appeal. Besides, the spyware snafu seems to be resolved now. So keep that more positive outlook in mind as I tell you about the new VIVO 8. As far as I can tell, this is Blu's first Nougat 7.0 device (I could have sworn one phone got an update to Nougat, but I can't find any info on that now). I'd say it's 'bout time, why isn't it even 7.1, and don't hold your breath for Oreo. Blu is boasting an 87.5% metal to body ratio, thanks to CNC polished aluminum on the back, minimal plastic, and a curved Corning Gorilla Glass 3 on the front. It has a 5.5" 1080p display, 13MP Sony IMX258 back camera and a 16MP front camera, 4GB of RAM, 64GB of storage plus MicroSD slot, and a MediaTek 6755 Helio P10 2.0GHz processor. There's a fingerprint sensor, "ultra quick" 9V/2A charging, and thankfully Blu didn't skimp on the battery like most brands and fitted this one with 4010mAh. Unfortunately, it charges with MicroUSB and not Type-C. The VIVO 8 is compatible with GSM networks and has 4G and HSDPA+ connectivity. It is already available for purchase in either black or gold, and it should retail for $299. However, now and for the first two days, you can get it for $199 on Amazon at the link below. That's not a bad price at all. 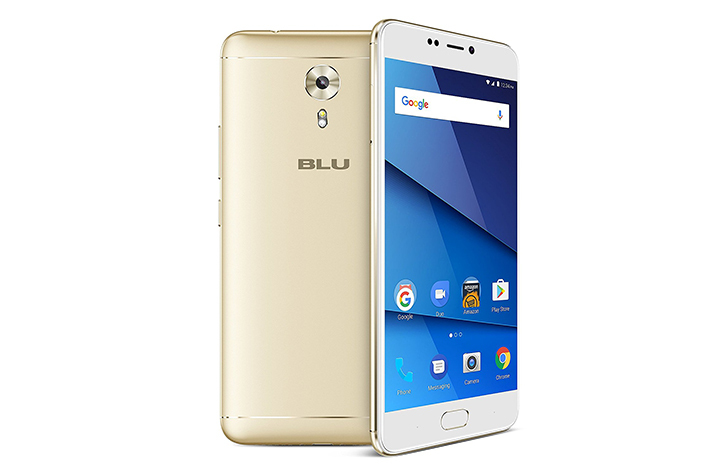 MIAMI, Aug. 30, 2017 /PRNewswire/ -- BLU Products, the market leader in unlocked devices in the United States, announced today the launch of the BLU VIVO 8, its latest flagship smartphone powered by MediaTek's premium chipset MediaTek Helio P10, a 64-bit True Octa-core™ LTE smartphone SoC designed for both high performance and power efficiency. The BLU VIVO 8 features a 5.5-inch Full HD display with curved Corning Gorilla Glass, ultra-fast Fingerprint Sensor, and superior camera performance. The BLU VIVO 8 combines state-of-the-art CNC machine technology of polished aluminum battery cover with minimal plastic for a premium smartphone design that is both functional and beautiful to look at. With an 87.5% metal to body housing ratio, it can withstand the daily wear and tear with ease. Along with built-in fingerprint sensor and curved Corning Gorilla Glass 3 display, the BLU VIVO 8's sets the flagship standard for all competitors to envy. "The BLU VIVO 8 offers a premium smartphone with flagship specifications at an incredible price," said Samuel Ohev-Zion, CEO BLU Products. "It provides a superior camera experience to anyone who does not want to spend over $500 on a smartphone." The BLU VIVO 8 boasts a 16 megapixel Super Selfie camera sensor featuring advanced technologies, F/2.0 aperture, and 1/3 inch sensor with 5P lens which provides more clarity and capture impeccable selfies. The main camera boasts a 13 megapixel equipped with a Sony IMX258 sensor camera featuring advanced technologies, F/2.0 aperture, 1/3 inch sensor with 5P lens, real-time HDR, and Phase Detection Autofocus (PDAF) with Laser Focus for twice the focus rate and accuracy. The BLU VIVO 8's 5.5-inch Full HD (1920 x 1080) 401 ppi display elevates the smartphone's visual experience to a new level with stunning graphics and life-like colors that seem to jump off the screen, protected by curved Corning Gorilla Glass 3. The BLU VIVO 8 comes with a super 4,010mAh battery with an Ultra-Fast 18W fast charging capability that will charge your phone to 100% in less than 90 minutes by using specialized dual charging chip technology. The BLU VIVO 8 is powered by the 64-bit MediaTek Helio P10 2.0GHz Octa-core processor and offers a seamless user experience, with the power to run multiple apps simultaneously, quickly browse the web, or enjoy smooth rendering of graphics for just about any game all while maximizing power efficiency.